The American astrophysicist Antonio Paris stated that 1977 signal known as "Wow!" attributed to extraterrestrials may be the result of two comets in space activity. USA – An American astronomer may have discovered the origin of the nearly 40 years mystery of the signal “Wow!” radio waves that alien contact attempts was considered. Analyzing the data obtained in August 1977, astrophysicist Antonio Paris (the University of St. Petersburg, in the United States) came to the conclusion that the strange signal may result from the passage of two comets. In a recently published study in the journal of the Washington Academy of Sciences, the scientist explains how the hydrogen cloud around the comet may have caused interference in simple radio telescope – and not attempts to communicate aliens to Earth. Almost forty years ago, Jerry Ehman, an astronomer who used the radio telescope Big Ear of Ohio State University, identified this event. At the time, strong radio waves were captured for 72 seconds. 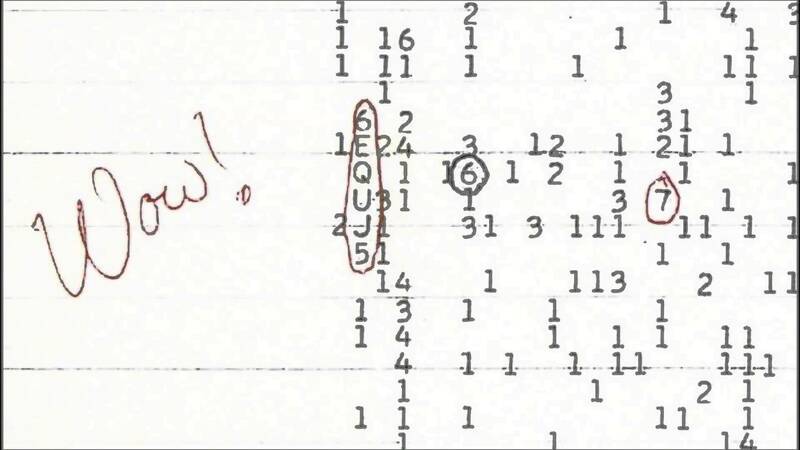 To identify them in the transcript, done by computer, astronomer circled the signal – represented by a sequence of letters and numbers – with a red pen and wrote next to it; “Wow!”. It was with this interjection that the event became famously known. Despite numerous attempts, the signal was never captured, making its origin a mystery, possibly, until now. Paris decided to rescue old information captured by the telescope and investigate them. He found that the strange signal may have come from comets 266p / Christensen and P / 2008 Y2 (Gibbs), which were discovered between 2006 and 2008. According to the study, the hydrogen cloud around the comet may have caused strong waves that were interpreted as signs of extraterrestrial civilizations seeking contact with Earth. On the day that the signals were captured, comets passing in the vicinity of the constellation Sagittarius, close to Chi Sagittarii group: exactly where scientists believe it was the origin of the strange waves. The scientist compared the frequencies of “extraterrestrial signal” with those emitted by hydrogen clouds, and found that they are quite close: both emit approximately one signal with frequency 1420 MHz. Financing campaign – However, before declaring his hypothesis as an accurate explanation for the sign “Wow!”, Paris need to test it. The 266p / Christensen comet will pass by Chi Sagittarii again on January 25, 2017, while 335P / Gibbs will return to the group on January 7, 2018. If you can observe these passages, pick up the signals by a radio telescope and analyze them the scientist can say and solve the mystery. But, like all radio telescopes are already being used nowadays in other research, Paris decided to launch a crowdfunding campaign in gofundme platform to raise the $ 13,000 needed to purchase a new device capable of capturing the waves. Some experts doubt that the hypothesis may be true but, according to Paris, even if it is not confirmed, this will be an example of how good science is done – and learn a little more about comets, there will be a new radio telescope to be used in future research.